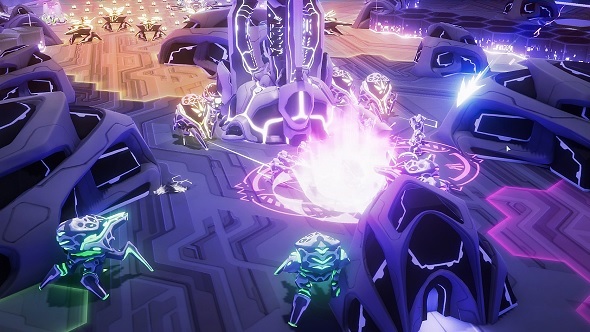 Free games: We have 1000 Steam keys for competitive cyberpunk RTS NeuroSlicers! You’re a hacker trying to make it on your own – no, you want more than that, you want to be the best Slicer in the network. But to get there you’ll need to reach higher than fighting for your share of cryptocurrency. There’s a truth hidden in the depths of the data. In NeuroSlicers it is your mission to uncover it. We’ll help you along, too, as we’re giving away 1000 Steam keys that will get you into the NeuroSlicers pre-alpha test. Keep on reading to find out how to get yours. NeuroSlicers is a competitive cyberpunk RTS that will have a full-blown multiplayer narrative campaign for you to get stuck into, as well asprogression mechanics on top of that. Matches are played in real-time and are made to run for between five to ten minutes in length – so you can fit them into your busy schedule. Unusually for the genre it’s in, NeuroSlicers focuses on speed, and as such, gives you total information of the battlefield and your enemy, removing genre staples like fog of war. The idea is for you toconstruct upgradeable buildings and use hacking powers that let you manipulate the levels, reconfiguring the environment and influencing the behaviours of AI-controlled units that fight for you. The NeuroSlicers pre-alpha test is running every weekend from now until June 4th, so you should have plenty of chance to check it out. If you do get a key then you’ll want to join the Discord and give the developers your feedback so they can improve the game. Now then, let’s get you a key – all you need to do is complete one of the actions in the widget below and you should receive your code. Follow the instructions at the bottom of this article to redeem it. Please read our terms and conditions before you enter.